2016 Toyota Prius c was created for urban living -- and small parking spots. As the smallest member of the Prius fleet, the Prius c makes residing in any city easier, and more fun. The Prius c features a shortened hatchback and thanks to its small scope and slim powertrain, the c handles fuel economy similar to that of its bigger brother at 50 miles-per-gallon combined. Check out the Toyota Prius and take it for a test drive here at Lakeland Toyota in Central Florida. Our passionate and knowledgeable sales staff here in Lakeland, FL are standing by and ready to serve our neighbors in Brandon and Plant City, FL. A overall redesign of the 2016 Prius c has produced an all-new and sportier style that keeps signature Toyota Prius essentials while at the same time advancing fuel economy through enhanced aerodynamics and lighter engine parts. The Prius c is offered in four numbered trim levels, and a Special Edition that’s based on the Two level. The well-appointed Prius c One comes standard with a tilt and telescopic steering wheel, steering wheel controls, color-keyed power outside mirrors with turn signal indicators; remote keyless entry system with the illuminated entry; air conditioning; power windows and more. The standard 3.5-in. TFT Multi-Information Display supports the driver with fuel economy information, outside temperature display, clock, cruising range, odometer, EV miles driven, trip distance, ECO Score, Hybrid System Indicator, ECO Savings, and energy monitor. The Prius c One also comes loaded with audio and multimedia equipment to match. Standard 6.1-inch touchscreen display, Entune Audio that includes the Entune Multimedia Packet -- AM/FM CD player and MP3/WMA playback ability, four speakers, auxiliary audio jack, advanced voice recognition, USB 2.0 port, iPod® connectivity. The Prius c One Trim also features Bluetooth® hands-free phone ability, music streaming, phone book access, and Siri® Eyes Free. Prius c Two adds an across-the-board upgrade with textile-trimmed duo-hued seats, 60/40 split fold-down rear seats, six-way adjustable driver's seat, cruise control, engine immobilizer, and a cargo area cover. Prius c Three features technology additions with the Smart Key System on the front doors, Liftgate, Push Button Start, and remote illuminated entry. This trim also includes the Touch Tracer Display, Entune Premium Audio, Integrated Navigation, and App Suite. The Entune features everything on the standard format and adds six speakers, HD predictive traffic, Doppler weather overlay, HD radio, and Entune App Suite. It also comes with All Access Radio with three-month complimentary trial, AM/FM cache radio, SiriusXM, and Gracenote® album cover art. Economy meets more comfort in the Prius c Four, which adds LED fog lights, 15-inch eight-spoke alloy wheels, power tilt-and-slide moonroof with sliding sunshade, heated front seats, SofTex®-trimmed seats, steering wheel, outside mirrors, and backup camera. Toyota is giving the Prius c an infusion of playfulness for 2016, too, with the Prius c Special Edition Persona Series. Based on the Two trim, this unique model’s limited to 1,500 units. The Persona Series Special Edition comes exclusively in Black, with a choice of two unique color accents: Electric Lime or Cherry Pearl. You might’ve seen similar paint visuals on customized vehicles driven by pro athletes, but the design costs far less on a Prius c Special Edition, which also features 15-inch black alloy wheels and a custom “Persona Series” badge. 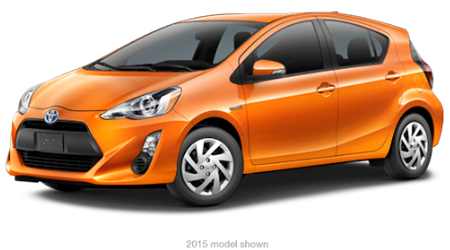 The Prius c’s 1.5-liter inline four-cylinder gasoline engine uses an Atkinson cycle to raise efficiency. The engine harnesses 73 horsepower and 82 pounds-feet of torque, providing a total hybrid output of 99 horsepower. Prius c offers three distinct drive modes: Normal, ECO, and EV Mode. ECO lessens general energy expenditure by managing climate control and throttle function to enhance vehicle efficiency. Under certain circumstances, EV Mode allows the Prius c to be driven exclusively by electric power for under a mile while staying below 25 miles-per-hour. The 2016 Prius c’s stellar EPA-estimated 46 miles-per-gallon on the highway and 53 miles-per-gallon in the city, makes the fun go even farther! For city dwellers everywhere, this compact 2016 Toyota Prius c will quickly take you anywhere. Designed with the city -- and small parking spots -- in mind. This fun, sporty hatchback also offers superior gas mileage, a comfortable ride, and a car full of high-tech safety features and color choices. You’ll get passionate customer service and an incredible price when you purchase a handsome, Toyota Prius c at Lakeland Toyota located at 2925 Mall Hill Drive in Lakeland, FL. Be one of the first in Brandon or Plant City to own this attractive, fresh, and enjoyable compact hatchback!